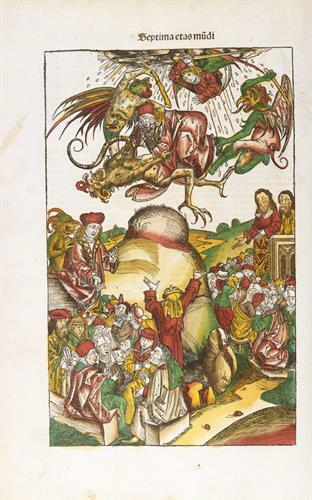 Created from 1493 to 1497, Nuremberg Chronicle retells the history of the world as it was believed at the time. The 600-page book was the most complex publication of its day, exploiting the new creation of the printing press to disseminate knowledge. With editions in Latin and German, the tome is illustrated with more than 1,800 woodcut images. In the years following release of Nuremberg Chronicle, an Augsburg, Germany, printer named Johann Schönsperger abridged the text, commissioned woodcuts largely copied from the earlier book, and released a smaller format, undercutting the price of the original and creating what could be argued to be among the earliest examples of theft of intellectual property. The Hyde also has a copy of the resulting Augsburg Chronicle, which will be included in the exhibition.